Nurses are at the center in providing palliative care, and at the center of the larger enterprise of exploring and finding effective ways of responding to the physical, emotional and spiritual suffering of patients and their loved ones. 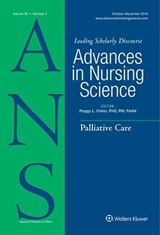 The articles in this issue of ANS Make important contributions to the theoretical, philosophic and empirical approaches that inform practices that shape effective palliative care. Follow this blog for information as each article is featured, and take advantage of the opportunity to download the articles at no cost while they are featured!